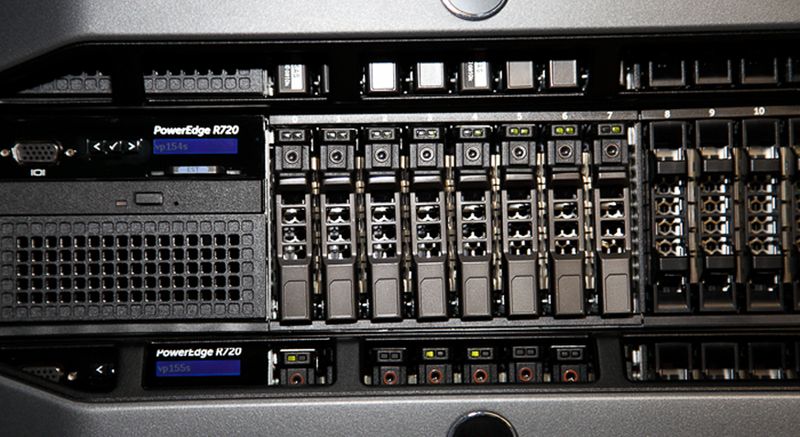 We’ve just completed a major upgrade to our RSS news feed indexing infrastructure, including a new “parsing engine”. This means that some non-standard news feeds that did not work before will most probably work now on your Protopage. We’ve just updated our Email Inbox widget. By popular demand, you now have the option to choose between displaying all emails or unread emails only. (Please note: existing Gmail users need to edit their widget settings change their inbox type from “Gmail legacy” to “Gmail” to enable this new option). In addition, we’ve added easy options to set this widget up for those with Gmail, Yahoo, Outlook, Hotmail, Aol and iCloud accounts. 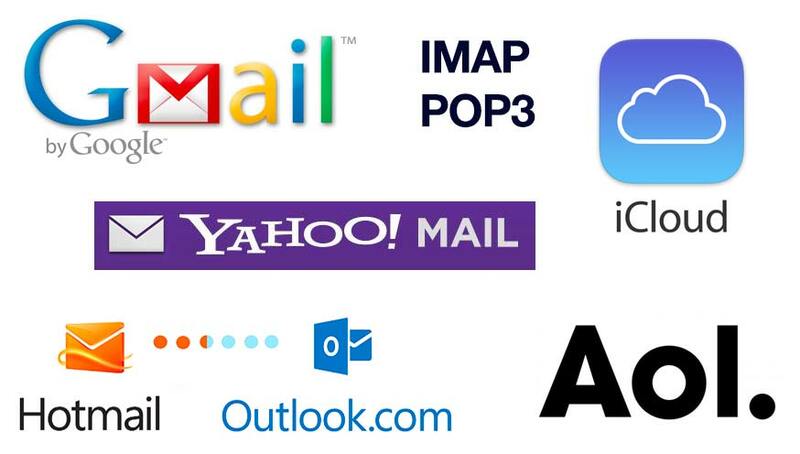 If you are using a different email provider, do a Google search for “IMAP settings” to find out how to configure this widget for your particualar provider. E.g. if you use FastMail, do a Google search for “Fastmail IMAP settings” to find the IMAP settings that you should configure your Email Inbox widget with. 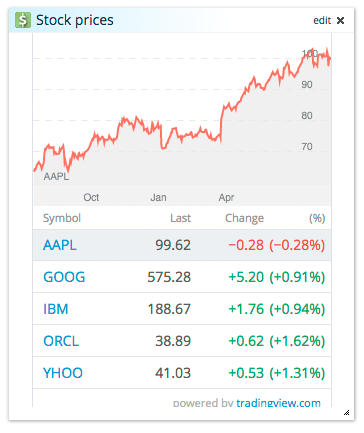 We’ve just released a brand new stock quotes widget to replace the old Yahoo Finance widget. Click the ‘edit’ button to enter your own list of stocks. 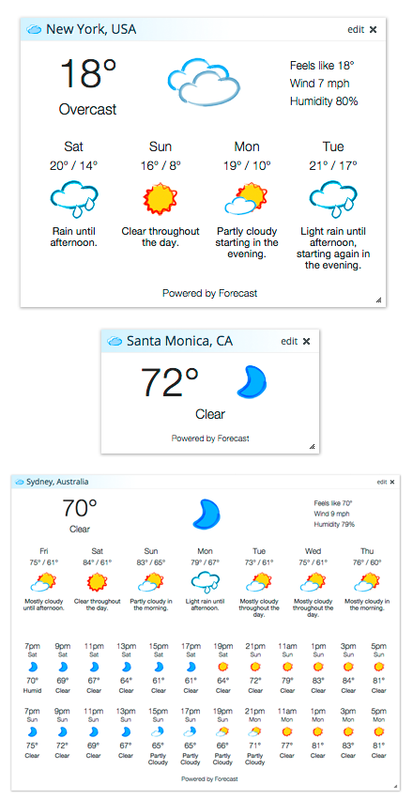 We’ve just released a brand new weather widget to replace the old Accuweather weather widget. Be sure to click the ‘edit’ button on your weather widgets to try the new 4-day, 7-day and hourly forecast modes. Enjoy! By popular demand, we’ve added some new display options for your news headlines. To access these options, click the Colors/Settings button at the top of your page, and look in the bottom left of that screen. You can now “line wrap” your headlines, so that the whole headline will show even if it’s too long to fit inside the widget. When you click a headline, normally it will turn gray and there will be a line through it. We now have the additional options of either hiding it completely, or leaving it unchanged. Finally, we now have a specific option to change the size of all news headlines on your page (this setting also applies to twitter headlines and email inbox widget items). If you have a browser that supports Ctrl/Cmd +/- to change the size of web pages, you may also find that a useful way to change the size of text on your Protopage (i.e. you hold down the Ctrl key and tap the + or – key on your keyboard. On Macs, hold down Cmd instead of Ctrl). Welcome to those of you that are migrating from iGoogle to Protopage this month. For those of you that are not aware, iGoogle is a Google competitor to Protopage that is being shut down by Google in a few week’s time. We’re very proud to have outlasted our competitors, and have been able to do so because we have not relied on outside investors or venture capitalists to fund our operations. We built Protopage to meet our own needs and desires for a start page, and we continue to work on the site to add and update features so that Protopage will be here for the long run. We are a small independent company, and are unique in that we do not rely on the mercy of a large internet company in order to justify our existence. Thank you to all of our loyal users. As we said when we launched Protopage 8 years ago, we are in this for the long term and we plan to see Protopage around for many decades to come! We’ve just released a new version of Protopage featuring a new lightweight design that will speed up your page load by 20-40%. 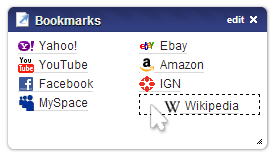 We’ve also added a new search bar, which will make it easier for you to access all of your favourite search engines. We’ve also released a new Twitter timeline widget that will display your home timeline from your Twitter account. (This is in addition to the existing Twitter profile and search widgets).